The Engineering teams play a key role in that. Our Engineering teams,comprised of our Technology Division and global strategist groups, build solutions to some of the most complex problems in the industry. From automated trading to managing data, risk analysis to safeguarding information and promoting environmental sustainability, our commitment to best-in-class technology provides Goldman Sachs with a competitive edge. If you are interested in learning more about opportunities at Goldman Sachs Engineering, we would like to invite you to join us at CUHK for our upcoming Engineering Alumni Chat. 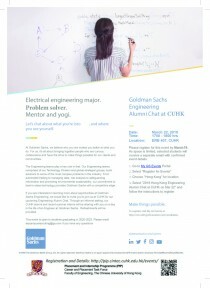 Through an informal setting, our CUHK alumni and recent summer interns will be sharing with you on a day in the life of an Engineer at Goldman Sachs.